Bell.Lloc 2008 | Catalan wine in a nutshell! Ruby colored with violet reflections, middle layer. Dense tears. Aromas of candied fruit (prunes) with distinct notes of vanilla. Toffee and aromas of Mediterranean herbs (rosemary, mint) and spices (liquorice) are intense. It is fresh and balanced on the palate, but also broad and persistent, allowing for a number of of levels when it comes to the taste. Bell-Lloc 2008 is a subtle combination of components that takes us to its origins by the sea and the forest of oaks in the heart of the Gavarres mountains. Pleasant and easy to drink. Sometimes……., it’s only the wine, other times it is only the property/winery, or the persons behind the projects or the location or, or, or……., many a times it is all of the above, including history, the present and the future. In the case of Bell-Lloc it is so much more. So perfect, so well thought through and utterly and distinctly checking all the boxes, hands down a true favorite, Come lIve Your Life With Me in D.O. Emporda, we’ll have to stay here for a weekend to enjoy the Bell-Lloc, (*Bell Lloc is Catalan and translated it is and means, Beautiful Place). I suggest you come and enjoy this piece of beauty in Catalonia and at that time, try the wines where they deserve to be enjoyed! The Finca Bell-Lloc winery is almost buried on the boundary between the vineyards and woodland. 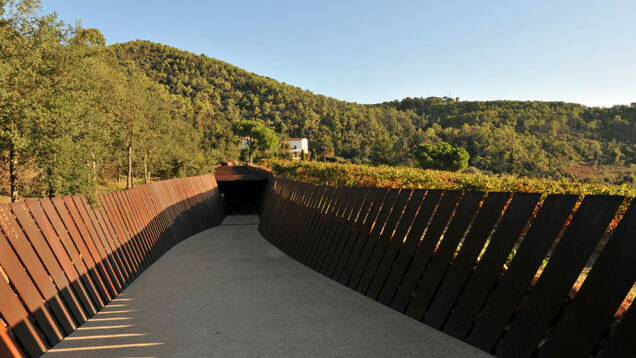 The winery building, designed by the RCR architecture studio of Olot, is surprising in its audacity and its perfect symbiosis with nature. On the surface, the parallel steel panels sloping in different directions are an original way of conferring a structured yet dynamic order on the complex as a whole. Meanwhile, the underground area is made up of a labyrinth of dark, insulated and cool passageways equipped with climate control. To enter this area is to penetrate into a world of shadows. 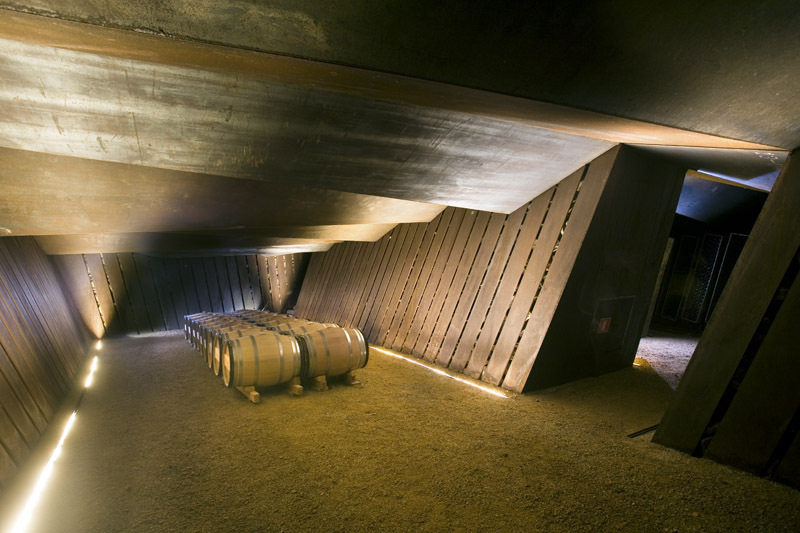 Down here the silence can be heard, the aroma of the wine can be perceived, the strength of the materials can be felt and, when it comes to tasting the wines, all five senses are finally stimulated. Introducing the farm in the lovely setting of The Gavarras (Girona) offers exclusive accommodation that redefines the traditional concept of luxury. 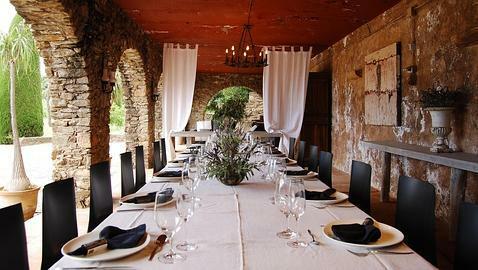 Finca Bell Lloc is a place where you could easily get lost for a weekend (or longer), Here you can celebrate a memorable event together with friends or family or enjoy authentic pleasures, like Catalan food and organic wine, or why not both in a combination? Located in Las Gavarras, near Palamos (Girona), yet off the beaten path in the middle of a magical environment consisting of olive trees, pines, vines and views of the sea. This old house, typical for the region, also has spectacular vineyards you can visit and participate in guided tastings. Everything in the Bell-lloc Villa is steeped in a philosophy that avoids unnecessary processing, and take advantage of advances to deliver the highest quality, without subtracting essence and authenticity. The farm is part of the Rough Luxe concept that proposes a new way of conceiving luxury as a moment in time and not as a high price commodity. The house of Bell-Lloc, which hosts the “hotel” has 6 rooms each of which has been decorated with a distinct style that gives them personality. Each room carries the name of some of the grapes that the winery uses for their production. Samso (Carignen), Garnatxa (Grenache), Lledoner, Malvasia, Xarello and Moscatell. This part of the property offering accommodation is completed with an attached three bedroom house surrounded by vineyards, ideal for family holidays, and an exceptional pool. 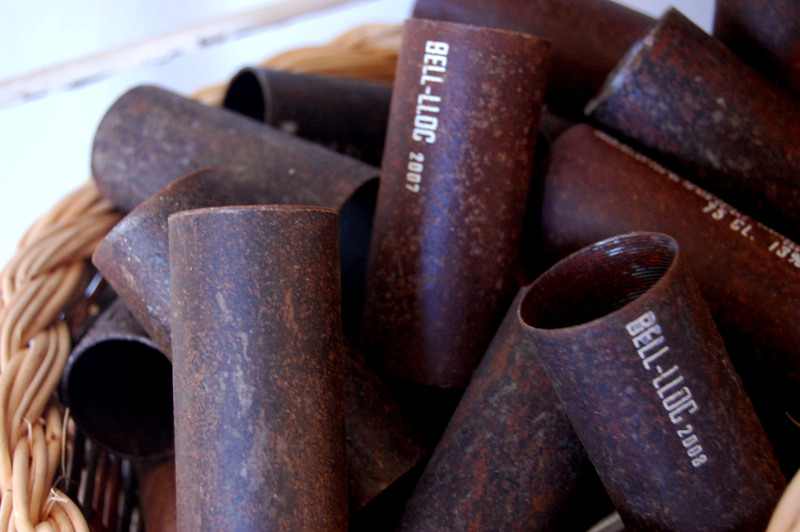 The wine bottles of the Bell-Lloc winery are unlabelled. Or at least not labelled as per “normal” standards. 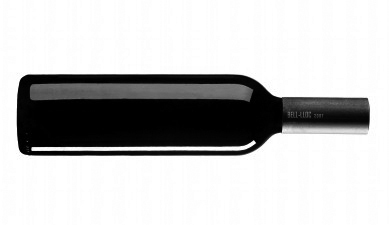 All you need to know about the wine, is very concentrated information which you will find on the very original metal housing that gives the bottle a very minimalistic style, consistent with the wine and the winery. 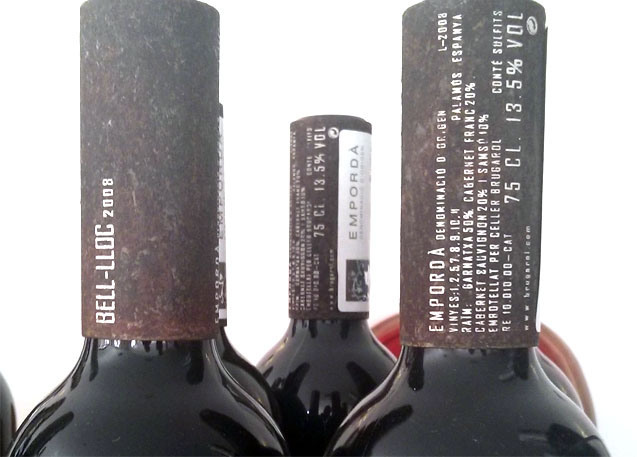 Josep Trallero, the winemaker at Bell-Lloc, says that “the capsule is of the same materials with which they built the winery and responds to our understanding of wine.” A wine and a philosophy that has “minimum presence of additives and the extreme care of the vineyard,” adds Trallero. Everything at Finca Bell-lloc is pervaded by the philosophy of avoiding unnecessary processing and taking advantage of progress for providing comfort and quality, but without losing any of its essence and authenticity. The wish of the proprietors is that every instant spent on the estate, is to be evocative and lasting in your memory. How is this achieved? By stimulating your five senses, without any tricks. Rough Luxe is having time for reflection; enjoying the pleasure of close encounters with people, nature, architecture and the environment; living cultural, social and gastronomic experiences associated with concrete geographic localities. And giving time and all that surrounds us the high importance it deserves.